these days’ the word BBQ means different things to different people. 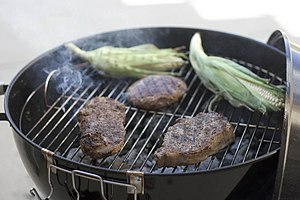 I have lately come to the conclusion that to the majority of folk’s BBQ describes a social gathering of one or more people, the main purpose is to cook out in the open, enjoy the weather, food and company. 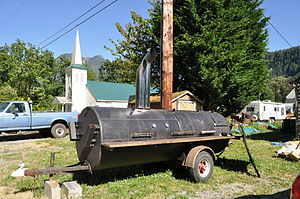 (Even BBQ restaurant’s used to cook their food outside). 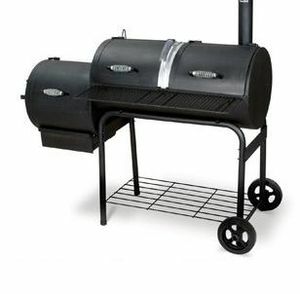 Since each region, restaurant, family and grill cook swears that their version (smoking, grilling, open fire, covered grill, etc) is the gospel, describing BBQ as a cooking method seems rather futile to me . 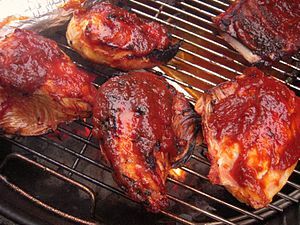 However, I had many a chef getting his / her knickers in a twist discussing what BBQ actually and REALLY means, so I just accept whatever is the explanation of the day. 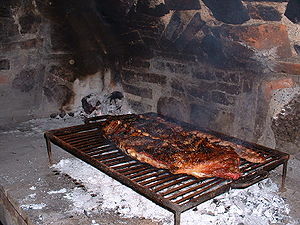 ( Even the origin of the word Barbecue seems to have different proponents ). 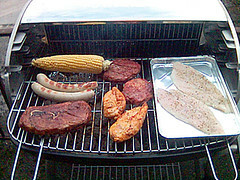 Grilling (never covered), Smoking (always covered) Jerking ( a combination cooking metod, since we grill, smoke and steam at the same time) and “the way of Life BBQ”, where we use any cooking method traditionally employed in our area and / or backyard, invite a bunch of friend’s and family over and have smoked, grilled, jerked food, maybe a barrel of beer and lot’s of fun. Please give us your opinion in the poll below. 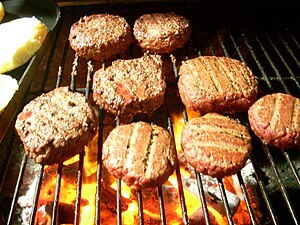 Nothing is much better than having a great BBQ with friends and family and great food. Sauce is key!! if you have a good sauce that makes the best BBQ. What I have found out if getting a simple “base” sauce with a good hickery, smokey flavor then adding your own “signature” spice to it. Depending on the crowd and the protein differnt spices work good in different situations. 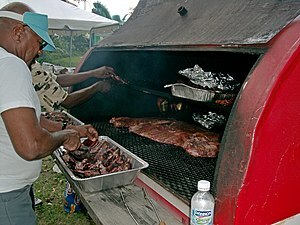 I would have to say that what makes a good BBQ is first and foremost a good cook and loved ones to enjoy it. After that how you chose to prepare the food is up to you. WHOLE spit roast Oxen ! Both videos make my mouth water. 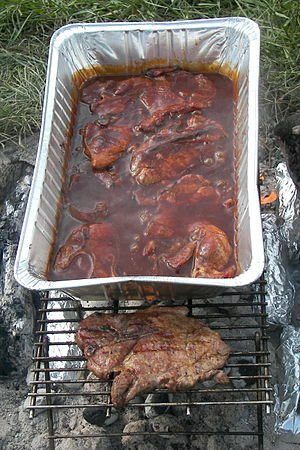 Being a Kansas Citian AND a former professional BBQ Pit Cook at Gate’s BBQ in Kansas City I learned from the masters that in BBQ that you cook with Fire, Smoke, and Water. 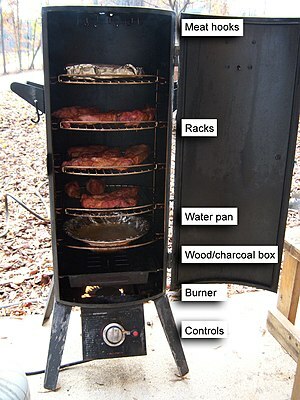 The rub you use is more important than the sauce, type of pit, or method of cooking. Sauce can be important but if the rub used creates a bitter product, no amount of good sauce will hide the disappointment. 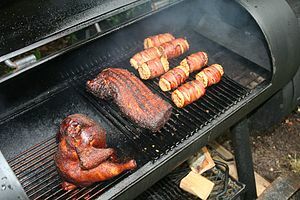 Low and Slow, as done in compitition style and backyard BBQ’s or the higher temperatures and shorter cooking times of professional BBQing where pit management (the moving and/or placement and positions of the meats in the pit) it makes no difference as long as you aquire the skills (which are easier than most BBQ pitmasters let on). Not sure what city started it but as far as chain BBQ I enjoy eating at The Whole Hog. They put no sauce on their meats. However the table has six different sauces for you to choose from. Delicious.